What do you call an effect that isn’t quite a Bit Crusher, or an Octave, or a Harmonizer, or a Ring Modulator, or a Lo-Fi dirt box/fuzz – but a bit of a blend of each? Yeah – we don’t know either, so we came up with “Harmonic Pixelator”. 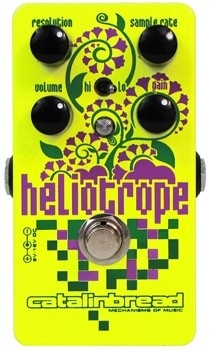 The Heliotrope is an "analog bit crusher" of sorts. Since there is no analog to digital conversion happening it isn't a true bit crusher, hence the name "Harmonic Pixelator". It works with guitar, bass, keyboards, etc. We designed the pedal to be intuitive and easy to use even though what it is capable of sonically is actually quite complex and varied. The Heliotrope can be powered from a 9v-18v adapter or a 9v battery. At 18v you’ll notice more output volume and headroom is available.